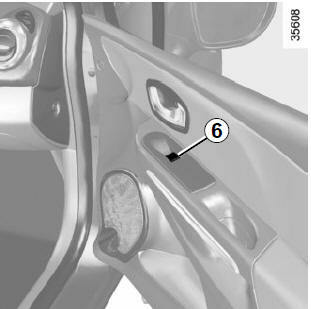 Safety of rear occupants The driver can prevent operation of the rear electric windows by pressing switch 4. A confirmation message is displayed on the instrument panel. Driver’s responsibility Never leave your vehicle with the RENAULT card inside and never leave a child (or a pet) unsupervised, even for a short while. They may pose a risk to themselves or to others by starting the engine, activating equipment such as the electric windows or by locking the doors. If any part of the body becomes trapped, reverse the direction of the window immediately by pressing the relevant switch. and 5 for the rear passenger windows. 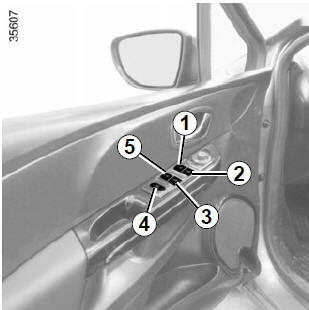 Depending on the vehicle, this mode works in addition to the operation of the electric windows described previously. It is only fitted to the driver’s window. Briefly press or pull switch 1 fully: the window is fully lowered or raised. Pressing the switch again stops the window moving. 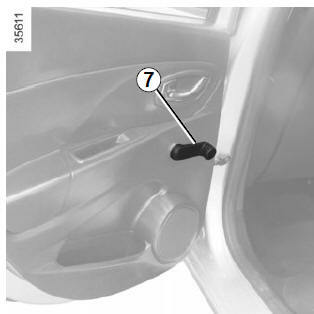 NB: if the driver’s window detects resistance when closing (e.g. : fingers, branch of a tree, etc. ), it stops and then lowers again by a few centimetres.